Due to the holiday in most parts of the world, EURUSD is moving very slowly. 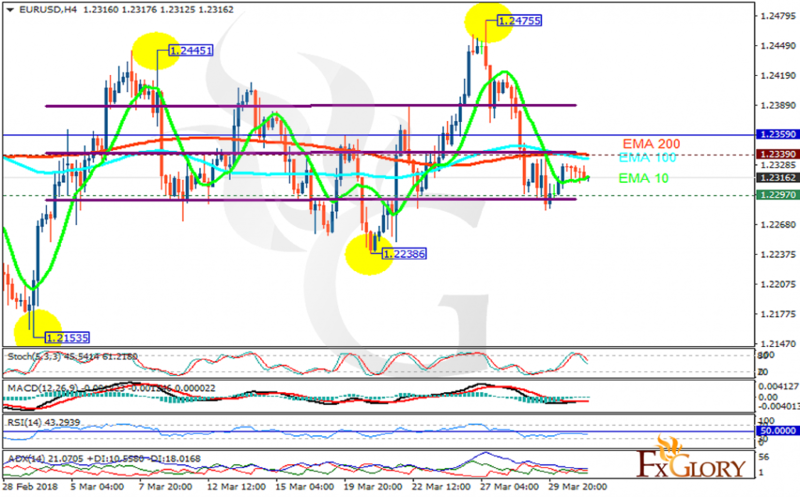 The support rests at 1.22970 with resistance at 1.23390 which both lines are below the weekly pivot point at 1.23590. The EMA of 10 is moving horizontally in the horizontal channel and it is below the EMA of 200 and the EMA of 100. The RSI is falling towards the oversold area, the Stochastic is showing downward momentum and the MACD line is on the signal line in the neutral territory. The ADX is showing sell signal. The indicators are showing downward trend which in this case, EURUSD will target 1.2280, otherwise, the pair will be fluctuating within the support and resistance area.